Quentin Tarantino likes it, but most critics hated it and audiences ignored it. 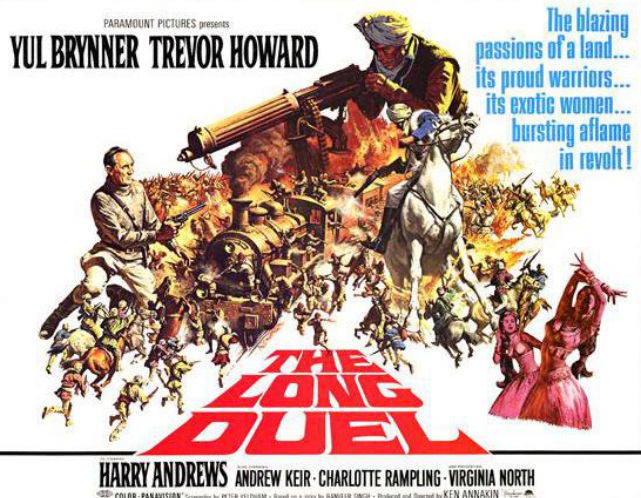 Yet The Long Duel has a good cast, a fine director of action and an exotic setting. And it's got an unconventional perspective on British rule in India in the 1920s. So what's the problem? 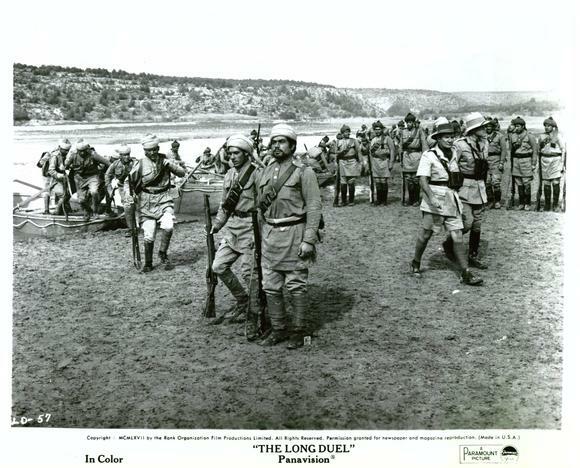 The Long Duel borrows elements from some of the very best films about the British Raj - Gunga Din, North West Frontier, King of the Khyber Rifles. The story itself follows the Robin Hood genre. A brave local tribal ruler, Sultan, (Yul Brynner) wants to overthrow British rule by using his armed followers, who occupy an uneasy status between that of dacoits (gangs of robbers) and freedom fighters. A British police officer, Freddie Young, (Trevor Howard) comes to admire the rebel leader and wants to reason with him rather than kill him as urged by some of his fellow officers, especially the cynical Stafford (Harry Andrews) who relies on armed force. The British eventually call in Young to implement a new attitude; believes that a sympathetic approach will be more successful in quelling the revolt than the official hardline approach. Howard of course, is in love with Stafford's daughter, to complicate matters. It's set in a troubled province in north-western India in the 1920s, where local rebels led by a brave tribal ruler are trying to overthrow British rule. Its got battle scenes in exotic settings (Spain substituting for India). There are sympathetic and far-sighted British versus hidebound, reactionary British. There's a train, always good value in movies about the British Raj. There are seductive dancing girls. What's more, the cast and crew are talented. 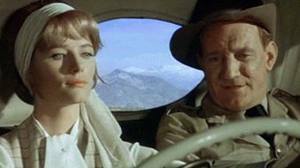 There's the always reliable Trevor Howard, and the gruff Harry Andrews. Charlotte Rampling makes an early screen appearance. Cinematography is by Jack Hildyard, famous for his ability to capture exotic locations in glowing colour, and who won an academy award for Bridge on the River Kwai.The film is directed by the greatly underestimated Ken Annakin, a prolific, no-nonsense film-maker adept at making British comedies and fast-moving action/war movies, and whose work includes such entertaining films as The Story of Robin Hood, Battle of the Bulge, Swiss Family Robinson, a key section of The Longest Day, and Those Magnificent Men in Their Flying Machines. His work is admired by Mike Leigh, a director whose gritty, sombre movies about social and political issues are almost the antihtesis of Annakin's films. Yet for Leigh, Annakin showed an "extraordinary range of style and subject-matter.... a truly great master of successful, commercial, cinema." 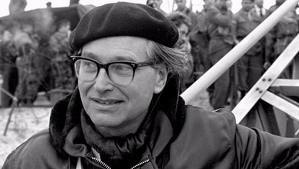 Ken Annakin on location for his section of "The Longest Day". Jack Hildyard, cinematographer for "Long Duel". 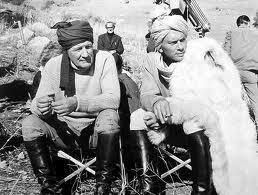 Trevor Howard and Yul Brynner on set of "Long Duel". Yet The Long Duel is a failure, although an interesting one. The battle scenes are convincing and crisply shot. From the onset it suffered from financial and production problems. As Annakin observes, the three female characters,added at the producers' insistence, are unnecessary and the romance between the Charlotte Rampling character and Trevor Howard (an age gap of 30 years) is contrived and unconvincing. Worse still is the script: clunky, cliched and long-winded. 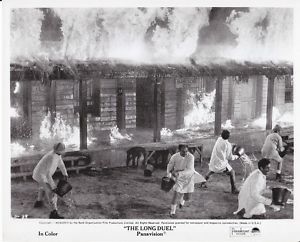 The conflict at the movie's heart - to treat the rebels with sympathy or to destroy them - loses its interest because of the ponderous dilaogue given Trevor Howard and Harry Andrews. The awkward scenes of narrative exposition slow the film down. Finally, Yul Brynner turns in a one-dimensional performance as Sultan as the Robin Hood figure: he glares, scowls and frowns and rapidly becomes unsympathetic. British moviegoers may well have been put off by the presentation of 1920s' British rule in India as deceitful and repressive; the tribal rebels seem vague and undefined. As a result, the viewer has little interest in the outcome for either side. However,The Long Duel remains of interest. Its central theme, although clumsily presented, is thought-provoking and very relevant in the light of the Iraq invasion and Afghanistan. What is a foreign power doing in an area far from its own borders? Do good intentions justify imperial rule? How can an imperial power best deal with an insurgency in a nation so culturally and socially different? Should opposition / resistance best be overcome by force or by understanding and sympathy? 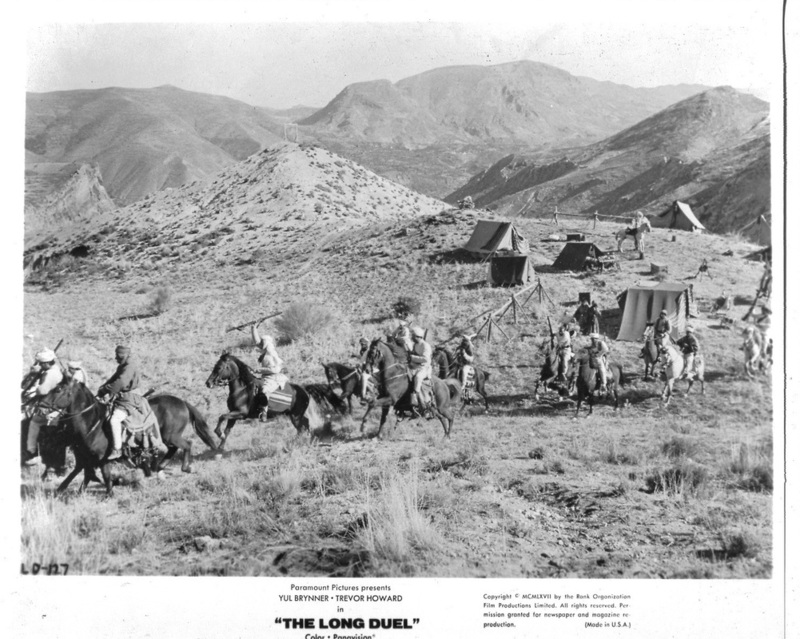 For all its faults, The Long Duel at least shows that there are no easy answers and that good intentions have unforeseen consequences. An attack on a train is the climax of the film. Yul Brynner scowls a lot but brings little style or empathy to his role. Annakin suggested filming in Spain after initial Indian financing fell through. Annakin is adept at scenes showing preparation for battle and the location of troops on terrain. 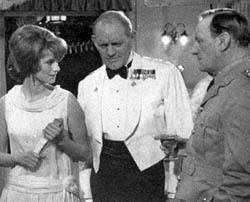 Harry Andrews (centre) rpersents the old, strict approach while Trevor Howard is in sympathy with the India tribesmen desire for independence. The romance between Howard and Andrew's daughter (Charlotte Rampling) is unconvincing. 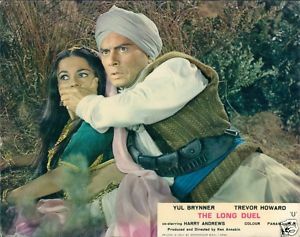 Whereas The Long Duel's action scenes are convincing, Yul Bryner's performance is disappointing and the female characters add little to the plot and theme. The sequence below gives some idea of the film's weaknesses.